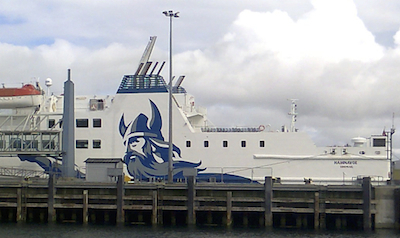 Scottish independence — as seen from Orkney. A PAIR OF elaborate monuments frames St Rognvald’s Chapel at the east end of St Magnus Cathedral, Kirkwall. 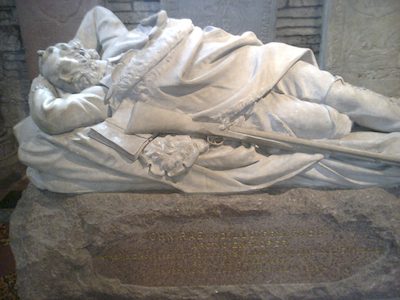 Magnus was canonised in 1133, and his cathedral was begun in 1137, at the initiative of Rognvald (‘Ronald’), Magnus’s nephew. 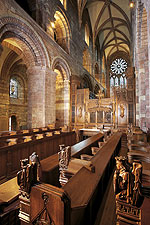 It’s thought that English masters (architects) and masons who had worked at Durham Cathedral and Dunfermline Abbey were employed in construction of the first phases of St Magnus Cathedral. ‘The choir, which is the earliest part, is the finest Romanesque work north of Durham, which inspired it’.1 To the north side of the apsidal altar is a monument to William Balfour Baikie, and to the south, another commemorating John Rae. Between them, on the central altar, an open copy of Scripture, in Norwegian, the pages turned each day, and next it, a rather fine model ‘Viking’ long ship. There is a (male) poets and scholars’ corner here too, with one space vacant, top right. The fusion of diverse cultures and connections within this east end is formidable, moving yet bizarre, intensely masculinist; Mary is not present, perhaps purged during Reformation. In the West African language of Igbo, ‘beke’ means ‘white man’, and ‘ala Beke’ means ‘Baikie’s country’, Britain, the United Kingdom, perhaps it may have mapped on to Orkney too. William Balfour Baikie, MDRN, FRGS, FBS, FSA (Scotland), born Kirkwall 1825, died Sierra Leone 1864, was a remarkable example of one of those many Scots and Orcadians who were at the heart of the British imperial project—in Baikie’s case making, I want to say, an enlightened contribution. Committed to the abolition of slavery, Baikie courageously explored the Niger river for navigation and established a settlement that developed into the city of Lokoja, where he took an onerous role as governor, doctor, teacher and missionary; he also made significant contributions to the study of the region’s languages. The fulsome tribute on his monument, very much of its time, reads, ‘He devoted life, means, and talents, to make the heathen, savage and slave, free and Christian man. For Africa, he opened new paths to light, wealth and liberty – for Europe, new fields of science, enterprize and beneficence. He won for Britain new honour and influence, and for himself the respect, affection, and confidence of the chiefs and people.’ William Baikie would doubtless be shocked by some of the consequences for Nigeria of these ‘new paths to light, wealth and liberty’. Opposite Baikie’s memorial is that of John Rae, if anything an even more intrepid explorer and scientist/scholar than the founder of Lokoja. Born in the Hall of Clestrain, 1813, Dr Rae is regarded as an unsung hero by many Orcadians. He was the most effective and courageous explorer of the Canadian North West because he alone adopted techniques of the Cree and Inuit peoples that enabled him to travel further and more safely than conventional expeditions of the time. In 1854, Rae learnt, from Inuit hunters, the fate of Sir John Franklin’s expedition to find the Northwest Passage: Franklin’s men had resorted to cannibalism in their last days, before finally dying of starvation and exposure. Lady Franklin and the establishment refused to accept Rae’s report, and he was vilified in the press, by, among others, Charles Dickens, in Lady Franklin’s employ.2 Rae’s effigy shows him at rest, rifle to hand, and a book just laid aside. For years I assumed that this would be the obligatory Bible text, but Rae seems to have had no strong religious convictions, just observing the forms as required; the volume is a Collected Shakespeare, his copy presently in the National Library, Edinburgh, which I hope to page through, before too long – which plays thumbed most heavily, any passages marked for reference? MacInnes’s ‘Orkney and the New Class Culture’ forensically describes the repressive structures of Orcadian society in the 1950s and ‘60s, ‘feudal patronage and allegiance to the mores of the Protestant Kirk, the Masonic lodge, and the acceptance that you would be Christian, subservient and thankful’. But her description of the childhood world of Stromness and its ‘tripartite gang culture’ is moving, as in the experience of walking the length of ‘the Street’, hearing ‘the noise of electric saws, smell crabs being boiled, fresh bread baking, oatcakes or fudge wafting, see beef carcases dripping blood on the floor through the back door of the butcher or the hose swill the blood across the street into the town drains’. This evokes an Orkney that was the continuous inspiration for George Mackay Brown, in his poetry, fiction and journalism. Then Fiona MacInnes describes the developments in Orkney since the mid 1980s – the ‘de-realizing’ of neighbourhoods through increasing social stratification, inward migration, gentrifying, bringing a ‘new middle class [which] is a self-sufficient social enclave of its own’. There is genuine bitterness in the way these changes are described and analysed, the dislocation of everyone from the means of production, and the meaning of work itself, outsourced to ever poorer communities more open to exploitation. Orkney is now firmly branded and packaged, corporate operations and ethics securely in place. It is hard not to recognise the truth of some of MacInnes’s description, but then easy to say that the same process has de-realized nearly anywhere that you care to name, and Orkney was never going to be able to exempt itself from global developments, so analysis and response have to take a wider view. Historically, Orcadians participated in precisely the explorations of ‘remote’ societies that established the grounds for future appropriation – Baikie in Lokoja, Rae throughout the far North West; and then, the whaling industry, the economic benefits brought by two world wars, for good and ill, and the black, black oil (80 per cent of which should stay where it is, to avoid that tipping point rise in global heat) – Orkney is a critical hub. Partly because of arguments like those made by Fiona MacInnes, I choose to do an interesting but sometimes demanding job here, ‘in the community’, as a way of earning my place, at least in my own eyes. Thanks to this work, I meet a wide range of people from many different parts of the islands. For this essay, the informal research, beyond reading, has been to quite neutrally ask about independence and the vote, and then just listen. The bright, twenty-something Orcadians I occasionally work with, no Uni-graduates, all seem…uninvolved and unmotivated, on a different planet. A LADY TAXI driver said the whole thing made her really angry, it was such a big thing, and there could be such consequences; she personalised it vehemently around the lead politicians. She hadn’t confronted thinking about which way to vote yet, she was so flustered by the business, she said. A very elderly lady, and from what I know, a (rare) Conservative Party voter, was also perturbed, ‘It’s a kinda going backward,’ she said, then tellingly, ‘All of that fightin’ …’, with a slightly despairing gesture, not able to complete her sentence. The bright, twenty-something Orcadians I occasionally work with, no Uni-graduates, all seem ‘totally disregardless’, in one way or another; completely unmoved by the question and the argument, the opportunity of the vote, uninvolved and unmotivated, on a different planet. These were only half a dozen voices from young Orcadians, but they were consistent. This sort of thing just wasn’t where they lived their lives, it seemed. It’s as if they are beneath and beyond the whole question simultaneously, down in the street, living within young life, and then out there in ‘the cloud’, almost anywhere (though physically transacted in a very large shed somewhere in Utah). After a week of formal study and debate in their schools, Orcadian sixth-formers voted 75 per cent against independence (for me, this is one fact to remember, when I’m havering). A former fisherman from Westray, as soundly ‘Orcadian’ a soul as you could imagine, laconic to match, ‘It ain’t bust, so why fix it?’ Elderly farmers speak similarly, and say unrecordable things about the politicians away in Edinburgh. 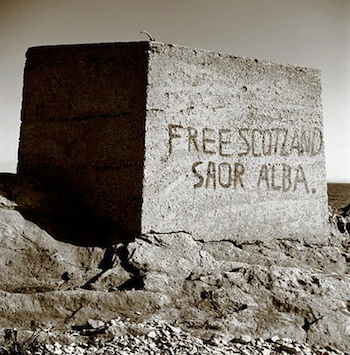 Yet to talk of the Scots – or the Scottish nation – is often misleading. Local loyalty and regional diversity have more frequently characterized Scotland than any perceived sense of ‘national’ solidarity. Scottish identity has seldom been focused primarily, let alone exclusively, on the ‘nation’. The modern discourse of nationhood offers what is often an inadequate and inappropriate vocabulary in which to couch Scotland’s history. The authors in this series will show that there are other and more revealing ways of capturing the distinctiveness of the Scottish experience. Nationhood, I discovered, is necessarily indefinable, because every attempt at definition is a regressive reduction of all the people who regard themselves as rightfully dwelling in this place. With every day, and from both sides of my intelligence, the moral and the intellectual, I thus drew steadily nearer to that truth by whose partial discovery I have been doomed to such a dreadful shipwreck: that man is not truly one, but truly two. I say two, because the state of my own knowledge does not pass beyond that point. Others will follow, others will outstrip me on the same lines; and I hazard the guess that man will be ultimately known for a mere polity of multifarious, incongruous and independent denizens. I, for my part, from the nature of my life, advanced infallibly in one direction and in one direction only. AN END TO Trident, a sundering from the baleful, anachronistic Tory-dominated Westminster, the construction of a more generous, inclusive, progressive politics, following the Nordic example that was a dominant presence in the Northern Isles and the North Atlantic cultures of a millennium before (though not then as socially progressive, vide The Anglo-Saxon Chronicles). Better childcare provision, safeguard NHS Scotland, improve educational attainment and professional training, no more tragically wasteful and misdirected military adventurism, move away from market-dominated imperatives, for society and economy alike. But the troubling word is still there, even in a ‘civic nationalism’, necessarily then defined over and against an other ‘national’, somewhere south, which caused the problem in the first place, the Elephant in the Room and in the Bed. My fret is that, for some of the people who make these arguments, all of the disquieting potentials within any nation-based project will be there too, the same-old appeals that can be made, from the same-old elites and power structures, that will not fade unless radically confronted, to ‘hearts’ rather than ‘minds’, for mobilizations of one sort or another, too often malign and disastrous. That Queen will still preside, for goodness’ sake. There is a perceived failure of English political elites to give serious sustained attention to Scotland and Scottish issues, over a very long period. A major monetary issue emerged over the precise nature of an independent Scottish currency, which all UK political parties insist could not fall back on the Bank of England as lender of last resort in the event of another banking crisis. RBS and Halifax Bank of Scotland were bailed out by the UK Exchequer with £37 billion in the crisis of autumn 2008. Better Together argues that the rUK could not, and would not take on that degree of moral hazard, while on the other hand, an independent Scotland could not have control of its own monetary (interest rates, money supply) and fiscal (tax and spending) agendas, if reliant on the Bank of England as a shared, central institution. There would be consequences for an independent Scotland’s international credit rating (and that of rUK), borrowing rates and consequently taxation. Or an independent Scotland could continue using the pound without the permission of rUK, like … Panama, which relies on the US dollar in this way. There is wide disagreement over the future of state and private pensions, in an independent Scotland. Pro-union critics argue that risk is spread more widely for state-pension resources than would be the case in Scotland alone, and private- and public-service pension provision might be compromised, because not fully funded from within the smaller independent economy. This is denied by the SNP. ‘Better Together’ argues that Scottish universities benefit significantly from higher research funding as a part of the UK AHRC structure, which would not be the case for an independent state: Hugh Pennington, eminent bacteriologist, makes this case cogently. The availability of BBC output would also be compromised by a pro-independence choice, it is argued, with viewers north of the border paying a higher licence fee for fewer programmes and more advertising, as currently in the Republic of Ireland’s access to BBC broadcasting; the service south would also be compromised (This was the ‘Wot, No Dr Who?’ stooshie). Defence and foreign policy. Many of the voices arguing for independence, such as the Scottish Socialist Party, forcefully criticise the UK participation in the Iraq invasion, and the seemingly uncritical support given to successive US administrations’ defense policies. The Trident base at Faslane, holding Europe’s largest stockpile of nuclear weapons and located within forty miles of Glasgow, would be removed by 2020, according to SNP policy. Scotland would adopt a role as peace-making mediator in future conflicts, and advance the cause of a nuclear-free world, while remaining a member of (nuclear-enabled) NATO. Better Together argues that as part of the UK, Scotland participates as a permanent member of the UN Security Council, and has access to 270 embassies and consulates around the world; the SNP proposes between 70 and 90 embassies and trade missions. As part of the UK, Scotland also has membership of major bodies such as WTO, G8, NATO and the EU – membership of the last two might be compromised or delayed, for a newly independent state, and the status of rUK might also be diminished (debarred from the G8, for example). The combined UK currently deploys one of the largest aid programmes in the world, as a proportion of GDP, partly directed from a centre in East Kilbride. The SNP intends to create an independent Scottish Defence Force (SDF), 15,000 regular and 5,000 reserve members; Scots spending on defence would reduce from £3 billion to £2.5 billion, at 1.7 per cent of GDP approximately the rate of spend in the Scandinavian nations. Others arguing for independence, the Scottish Greens for example, would allocate much less to armed forces. The current UK defence bill is £34 billion, second largest in the world (3.88 per cent of global defence spending), after that of the US (40.2 per cent) and closely followed by China, Russia and Japan.22 Serving UK forces numbers are 100,000 troops, to reduce to 80,000 by 2018, 36,500 RAF personnel, 36,000 in the Royal Navy. Immigration. Scottish demographic trends indicate (as for Orkney) a shrinking and ageing population in future decades, relative to the rest of the UK, so a more active policy on immigration is required north of the border, and in the North Isles. Pro-unionists suggest this may create difficulties over migration flows to the rUK via an independent Scotland. Parties and attitudes such as those of UKIP seem to have little resonance in Scotland, so far at least, and an independent Scotland would be able to distance itself from the anti-immigrant rhetoric and prejudice on the rise in parts of England. David Cameron asserted in his Edinburgh speech, 2012, that ‘almost half of Scots now have English relatives’. YES: major parties and groups in favour: Business for Scotland, National Collective, Radical Independence Campaign, Scottish Campaign for Nuclear Disarmament, Scottish Green Party, Scottish Independence Convention, Scottish National Party, Scottish Socialist Party, Women for Independence, YES Scotland. The YES campaign receives enthusiastic support from large sectors of the creative community – musicians, writers, artists of all kinds, so their campaigning events tend to be a lot more fun. There’s also an unknown number of prominent figures who remain studiedly neutral or silent on the issue (not Sean Connery); some also write of feeling unable to declare for BETTER TOGETHER, for many reasons, and so make no public statements. The YES campaign also seems much more active via social media channels, though exchanges can become aggressive or vitriolic at times; ‘CyberNats’ trolling prominent NO-voters, such as J. K. Rowling, were denounced by all campaign managers; their virtual adversaries are termed ‘UniTrolls’. ‘Lady Alba – Gaga for Indy’ has been a big hit, as Bella Caledonia reports. THE TRADITIONAL PRINT-BASED media is thought to be generally more critical of the YES campaign; the Scottish Sun has a red-card / green-card assessment of arguments, and usually gives the red-card to SNP policy statements. Radio Scotland and BBC Scotland have been criticised for appearing to be more critical of the YES campaign, but they deny this and say they attempt to maintain strict neutrality in reporting and commentary. There are consistent suggestions from polling that female voters are more cautious about opting for independence than male voters, and more sceptical about the YES campaign’s central positions on economics, welfare, education and defence spending. YES offers more inspiring prospects that do engage many people, ethnicities apart, but the uncertainties are many; NO has generally been thought (unimaginatively) to have run a negative campaign, which has emphasised dangers and impracticalities of independence, as defined by YES. NO has seemingly offered too little in the way of a new politics, which is the potential offered by YES. We are trapped in a bind: adversarial, binary discussions are all there is left out there. Political discussions are fights-to-win, not forums for working out … All discussion is adversarial, adamance now passes for integrity and timorous people avoid political discussions because they’re afraid of a Paxman-esque mauling … Philosophically, there are massively complex questions to be addressed: how to weigh autonomy against economic stability? Can ‘identity’ be a value, and if so, can it meaningfully be measured against ‘fidelity’ as a value? We could be at the helm of a public, philosophical exploration of, for example, the scope of our social and moral obligations, of the limits of international interdependence, of twenty-first century conceptions of statehood. It could be the start of a new enlightenment. He said / She said ? Heart or Head ? 47 / 53 ? A possibly critical number of voters, perhaps 15 per cent, may only decide when they are within the sanctuary of the booth, the tethered pencil poised over two paper choices. You can read what you take to be well informed and politically astute opinion arguing, finally, that everyone’s decision will be a matter of the heart, Yeas and Nays are already committed, unlikely to be turned now (20.8.2014, postal vote despatched next week). A possibly critical number of voters, perhaps 15 per cent, may only decide when they are within the sanctuary of the booth, the tethered pencil poised over two paper choices (How quaint our voting rituals, ruinously so.) A Whitehall Treasury official, interviewed by Robert Peston, after running through calculations and possible projections for an independent Scotland and an rUK, concluded that, after about twenty years, there probably wouldn’t be much difference in the wealth and status of the respective nations compared to the present position, which ever way the vote went. So much for all the agonizing about monetary/fiscal end times. Perhaps it doesn’t really matter which way we jump. An independent Scotland (5,327,700 as of mid August 2014, the highest ever total, 0.07% of world population) could operate perfectly well, a state in character and politics shaping itself somewhere between the Nordic nations (Denmark, 5.6m, Norway, 5.05m, Sweden, 9.6m, Finland, 5.4m, Iceland, 320,000, Faroe Islands, 50,000) and the Republic of Ireland (4.6m). All UK, (64.1m). The Scandinavian model for social management is often invoked as the way forward, for an independent Scotland. Set aside the statistics and stop worrying about the pension, put down Gordon Brown’s memoir-manifesto, stop checking all the RadicalScot websites and twitter feeds, look into the heart. Strange advice, maybe, given that the heart isn’t necessarily such an impressively limpid zone, at the best of times: But … I feel that I don’t want to opt for a form of independence, which however idealistic, will imply a new difference, borders and binaries of some sort, from the self-confidently genial, ‘How’s yoos?’—certainly the majority—but through to those tiresome forms of aggressive self-assertion, latent alas everywhere. The nation-state is a recent development, with a chequered history in terms of what it has provided for those within its limits. The arguments that impress me are those that say the future lies with different kinds of aggregate identity and agency — supra-national collaborations, EU, UN (I hear the hollow laughter, but even so), UNRA, WHO, CERN … International Space Agency. These too are all state-bearing delivery systems, more or less, so beyond these, the autonomous movements across national boundaries and outwith conventional political institutions, following Naomi Klein’s anti-corporatist No Logo ethic.24 Then, with sub-national formations – cities, regions, ententes that can force innovation more rapidly, and not in less-than-zero-sum campaigns of competitive aggression (aka WW1, WW2, Cold War, the post 9/11 calamities). Perhaps we are having the wrong debate. Perhaps the whole notion of independence, at least in the context of the UK, belongs to the previous century. Scotland small? Hugh MacDiarmid convincingly said no, but nevertheless there is a bigger picture. That big picture could be a federalist Britain, acknowledging regional identities and ensuring functioning representation – bearing in mind that much of the north of England would be effectively disenfranchised by Scottish independence. This, I believe, could create something positive out of Britain’s fragmented and discordant past, and might even offer new possibilities for our social and cultural future. 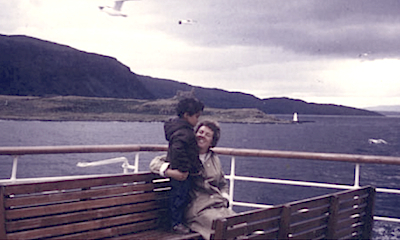 I wrote the last paragraphs during 8/9 August, between work visits on Flotta. There is no Wi-Fi connection where I stay, despite being within half a mile of the oil terminal responsible for 10 per cent of UK oil production. So I tuned in to radio news from time to time, following the ‘stories’—not really the right word—we all heard and watched. On 10 August, events outwith the Northern Isles and Scotland were reaching new levels of, let’s say, disorder. Zoroastrian Sufi Shia Yazidi pursued onto barren mountain sides in fifty degrees heat, pitiless, unthinkable actions against them; ebola spreading by embrace and handshake through Liberia and East Africa; imperial division of the ‘Middle East’ made 100 years ago now rotting and dissolving, granulating into ugly wounds — Syria, Iraq, and from a later moment though intimately connected, Israel, Gaza/the West Bank. Abandoned children press against the Mexico/US fenceline. Migrants intent on reaching what they take to be the sanctuary of the UK haunt lorry-park zones around Calais, Dieppe, the container stacks at Zeebrugge. The contours of the debate change from day to day—I read new contributions yesterday, and nearly changed my mind. On 19 September, the conversation will not stop, it has only just begun. A reformation is needed, and urgently; the Scottish referendum argument has opened up so many possibilities for a properly democratic, federalist, responsive future – for everyone. Borders once invented and imposed so confidently are now contested, erased, become meaningless, through the aggressions and oppositions that they created in the first place. Populations move across the Sykes/Picot line in the sand, because it has become just precisely that. The Scottish/English border is not going to revert to ‘debatable lands’ any time soon, but given these new shape-shifting times, which can only accelerate for the foreseeable future, I do wonder what it would mean to draw a new and somehow firmer line, through lovely Liddesdale and the Cheviots, to definitively distinguish Black Kipp from Wofee Head.27 Do we need more borders, more inner discriminations in our hearts and minds, however subtle, more lines cutting through landscape, memory, economy—or fewer, on both sides of all borders, and especially in hearts and minds? Nigel Wheale is the author of Raw Skies: New and Selected Poems (Shearsman 2005) and The Six Strides of Freyfaxi (Oystercatcher 2010). His academic texts include The Postmodern Arts (Routledge 1995) and Writing & Society: Literacy, Print and Politics in Britain 1590-1660 (Routledge 1999). BBC Scottish Independence: Referendum Library. Guardian Scottish Independence Blog and Article Archive (1400+). KILTR, ‘one clan many cultures’. National Collective, ‘join, create, collaborate’. This Fortnightly Review article is filed under the following rubrics: British politics, Chronicle & Notices. Publication: Saturday, 23 August 2014, at 13:44. Options: Archive for Nigel Wheale. Bookmark the permalink. Follow comments here with the RSS feed. Post a comment or leave a trackback. ‹ Spritz at the villa.